If you suspect that you have vitamin deficiency you may check that via blood tests and find out. Consult with your doctor and he will give you more information about blood tests. Beside blood tests, they are also other ways to find out if you are deficient in certain vitamins. They are many symptoms that point to some vitamin deficiency, of course, many vitamin deficiencies are actually rare, but for some, like we said, physical symptoms can easily point to a lack of certain vitamin. In this article, we’ll pay attention for vitamin deficiency which can be shown on our face. Pale complexion, also known as pallor is an unusual lightness of skin color. This pale color may caused by illness, anemia, stress etc. and this pallor is mostly visible on face. Beside the causes which we already mention, turning pale day by day may be due vitamin B12 deficiency. This vitamin deficiency also causes tiredness, poor memory, smooth tongue, diarrhea, constipation, so people who experienced these symptoms parallel with paleness, that is huge indicator for B12 deficiency. Lips with bluish tone instead of normal deep pink color, beside that they are pointer for heart and lung problems, pale lips may be indicator for iron deficiency. Add more food rich in iron, like spinach and other dark green leafy vegetables, beans, peas, fish and red meat. Bleeding gums usually are caused by inadequate plaque removal or when our teeth are not in good condition as they need to be, also bleeding gums are a sign for vitamin C deficiency. Add food rich in vitamin C into your diet, foods like dark leafy greens, bell peppers, broccoli, peas and citrus fruits. Brittle or dry hair and dandruff are nothing new and many, many people have these problem not knowing that this may be a sign of vitamin B7 deficiency. Although biotin deficiency is a rare disorder, it may be really serious issue. Add food rich in B7 vitamin into your diet, food as egg yolks, cauliflower, broccoli, spinach, legumes, mushrooms, cheeses, fish. 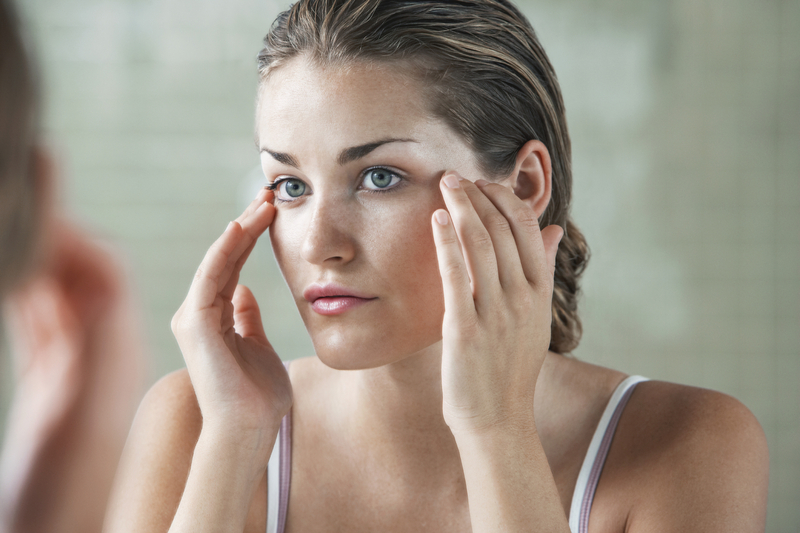 If your eyes are puffy or swollen that can be a sign for iodine deficiency. If your eyes are swollen and at same time you have brittle nails or dry skin or maybe you gain weight, that may be very serious indicator for iodine deficiency. Although puffy eyes are caused also due lack of sleep, excessive alcohol intake, allergies or hormonal changes, consult with your doctor for further examinations.